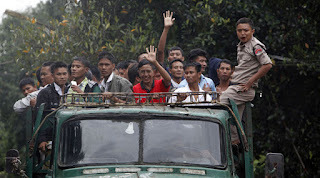 Nearly 7,000 prisoners in Myanmar, including some former military intelligence officials who had been purged by their army colleagues, have been given presidential pardons. An Information Ministry statement posted on its website said 6,966 prisoners, including 210 foreigners, will be freed from various prisons across the country “on humanitarian grounds and in view of national reconciliation.'' It was not clear if pro-democracy activists were among those being freed.